Adam Lallana came into the dressing room and apologised to his team-mates for the miss at the end of the game which could have clinched us three points. 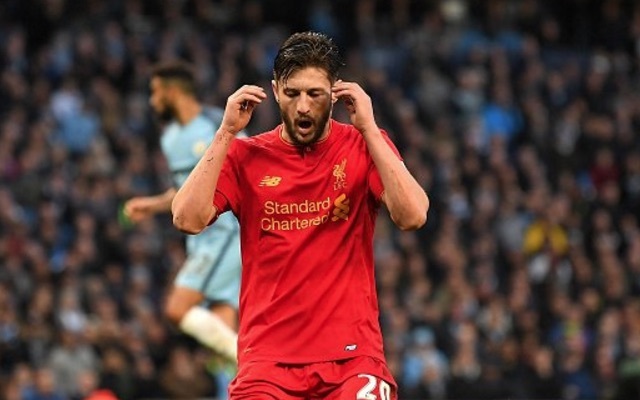 We drew 1-1 at the Etihad in what was probably a fair result, but with around ten minutes to go, Lallana somehow fluffed his lines from six yards out when it was surely easier to score. He’s one of our most skilful and composed players, so to see nerves get the better of him like that was mighty surprising. Manager Jurgen Klopp has explained though that there was no need for our 28-year-old to say sorry and actually paid the Englishman an enormous compliment as well. “Now I know why he thought he had to say sorry but he doesn’t have to because his performance today was outstanding again. “Obviously he is one of the best, if not the best, player technical wise I’ve ever worked with. If he can’t (score), then I thought because he had worked so hard before. In fairness, Sergio Aguero missed a sitter himself and Raheem Sterling should have bagged in the first-half, so it wasn’t like we were hard done by. In terms of pure footballing ability, City are probably the best side in the country, despite Chelsea’s consistency and ruthlessness. We’ve now got nine games left, but an irritating international break to put up with first in between.